Jarvis Lavonne Scott, athlete, teacher, and mentor, was born on April 6, 1947 in Waco, Texas to Ivory Scott and Johnie Mae Hester. Jarvis Scott, the eldest of six children, moved to Los Angeles, California when she was nine years old and later attended Pomona High School where she attained honors and developed her track ability. Upon graduation, she attended night school at Los Angeles City College, majoring in Business Administration. She also worked for the underwriting department of Continental Insurance Company of Los Angeles as a typist. 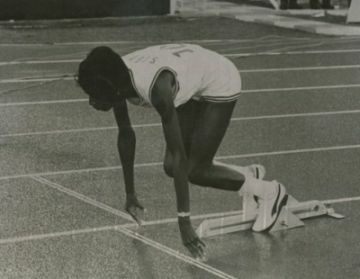 Scott qualified for the 1968 Olympics held in Mexico City, Mexico in both the 400 and 800-meter runs and held the fastest time in the world for these tryouts. There has not been another U.S. athlete to date, either male or female, who qualified for the Olympics for both the 400 and 800-meter run. At the 1968 Olympics, Scott gave up her place in the 800-meter competition to teammate Francie Kraker, allowing Kraker to have a chance in the Olympics. Scott finished in sixth place in the 400-meter run with a time of 52.7 seconds. After the Olympics, Scott returned to California and played forward with the Cubbies “A” basketball team in the Woman’s Athletic Association. She attended California State Los Angeles and ran women’s track and field. She also ran with the Los Angeles Mercurettes, one of the best and most competitive track teams in the United States. Scott competed all around the world between 1967 and 1973, including several cities in the United States, as well as Canada, Britain, Russia, Germany, France, Romania, Japan, and Colombia. Later, she coached at several institutions, including the Jesse Owens Clinic in Los Angeles, California, and Philadelphia, Pennsylvania; California State University, Los Angeles; and Pont Loma College, San Diego. She also lent her expertise for events in West Germany, Baton Rouge, Durham (North Carolina), Columbus (Ohio), Sudbury (Canada), Seville (Spain), and Havana (Cuba). In 1975, she went to Texas Tech and coached women’s track until her retirement in 1979. Along with coaching, Scott was active in her church and community. She also mentored students and challenged them to achieve their goals. Scott had an impressive career as a four-time National 400-Meter Champion 1968-1975. She was voted “Most Outstanding Young Woman of America” in 1980 and placed in the Honor Hall of Fame in California State University Los Angeles, in 1985. Three years later she was also an honored Black Olympian at the Smithsonian Institute in Washington D.C. in 1988. Scott currently resides in Lubbock, Texas. Newspaper clippings and resume in Jarvis Scott collection; personal communication with Amanda Banks.